Complaint: After visiting three different Toyota dealerships I could not find the color sought after in a popular certified "used" model. The fourth Toyota dealership had the right color but had no sticker price disclosed. Fox Toyota in Auburn New York offered me 2-3k less for my trade-in than the other dealerships but that didn't bother me much as they had the right color. When the salesman finally disclosed the price on the 2005 used model I wanted it was roughly $1,500 less than two BRAND NEW 2008 models on the lot that had more options. He said the two new ones they had on the lot were already sold. Under heavy sales pressure I caved in and traded in my car with 1/2 tank of gas and took delivery of the certified used Toyota. When I got in it had NO GAS and NO FLOOR MATS. Auburn, New York's Fox Toyota dealership would not give me a single drop of gas or any mats after spending 24 Grand and additional $800 for a 7yr/100k mi. warranty. Luckily, there was a petro station just down the street. While driving it home on the highway I noticed a steering problem. Checking under the steering column I noticed the window sticker was crumpled up underneath the drivers seat which was $500 less than I paid for it! 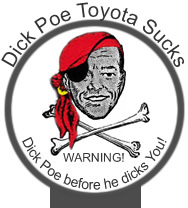 Note: The Fox/Toyota salesman previously said they were selling me the car $1,000 below sticker!!!! Soon after I called the dealership, they told me I'd get used to the steering and the sticker price was a typo. Being unsatisfied I politely told them if they'd take the car back since only having it one day, order me a BRAND NEW Toyota and I'd pay the difference in CASH with no haggle. They said NO! After complaining more they said they would look the steering but I'd have to wait a week or two. After complaining even more they let me bring it in the next day. After waiting five hours in their service dept drinking cold coffee I overheard the service mgr. talking behind my back and balking about other Toyota customers. Not to my suprise they found nothing wrong with the vehicle. By that time I was so peaved I DEMANDED floor mats.....they finally caved in and ordered a new set for me at no charge and they would mail them to me. They phoned me...the floor mats came but they had me pick them up 75 miles away! $2500 ripped off on trade in + $1500 ripped off on sticker price + $30 ripped off on gas = $4030.00. Plus, driving 150 miles (roundtrip)for floor mats...COLD COFFEE, UGH! What these blokes don't realize is that my uncle current works at a Toyota plant and I PREVIOUSLY WORKED FOR TOYOTA at their main North American Headquarters. There I read "The Toyota Way" like the bible, learned all about Kaizen, the toyota production system(TPS) etc.. Toyota plants are run smoothly with an extremely high degree of integrity with no waste (muda) in japanese. While working at Toyota it was all about cleanliness, honest hard work, no excuses and CONTINUOUS IMPROVEMENT every second, every day, every month, every year both in personal life and at work. While there, always wished some day I would be able to afford a new or newer quality Toyota. Not so mad at having been swindled...More upset of the sweat and tears I worked so hard at making a quality product that these gutter salesmen kindly take for granted. PS: There was no steering problem...just the cheapo tires that shady dealer had put on.